Protein contains nutrients essential for your body to function and repair itself. The essential and nonessential amino acids in protein sources are responsible for building and repairing body tissues, which is necessary for anyone trying lose weight and who may be exercising frequently. Intense exercise can cause muscle tissue to break down; consuming adequate protein helps to repair and rebuild the muscle tissues, and prevent further breakdown. Eating protein before sleeping may also help keep metabolism high and prevent hunger cravings. Consuming a protein source prior to bed is intended to keep your metabolism elevated while you sleep. The amino acids in protein also work to prevent muscle breakdown from occurring through the overnight fast. Proteins are essential for body development, replenishment of lost blood, healing of wounds and scars, replacement of dead cells and hair and nail growth, according to the Dietary Fiber Food website. 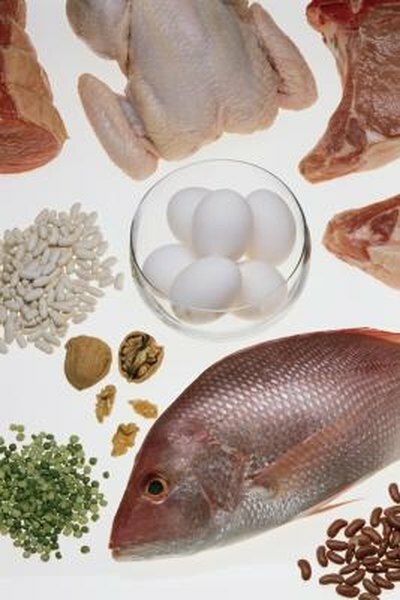 Consume lean protein sources prior to bed such as chicken breast, egg whites, tuna or protein powders. Protein powders are often the easiest to consume at night — they are easily mixed with water or milk, and can quickly provide your body with amino acids needed for muscle repair and immune function. Protein powders or shakes can help to stabilize blood sugar levels, and can help prevent overeating and cravings. Consult your doctor before using any protein or other supplements. Casein protein is a form of milk protein that is slow-digesting and often consumed at night prior to bed. Casein protein delivers amino acids to the tissues over a longer period of time than whey protein; this may be more beneficial during an overnight fast, SportsScience.co notes. Planning is an important part of weight loss. You must time your meals appropriately to elevate your metabolism and lose weight. Consuming five to seven small meals daily consisting of lean protein, whole grains, healthy fats, vegetables and fruits is the best path for weight loss, according to the Mayo Clinic. Consuming your last meal of the day 30 to 60 minutes before bed would be ideal if you are eating every two to three hours. To lose weight, you must burn more calories than you consume. Consuming a protein shake or other protein sources prior to bed, in addition to your usual diet, may hinder your ability to lose weight or even cause weight gain, the Mayo Clinic warns. Be mindful of your total caloric intake for the day prior consuming an additional protein source prior to bedtime. Consult your doctor before making any drastic dietary changes, and for specific recommendations on weight loss. Mayo Clinic: Protein Shakes: Good for Weight Loss?